Grab a Cold One at the Beach this Summer! There is something so refreshing about a frosty mug of beer on a hot summer day. We think there is no better place to enjoy a cold one than here at the beach! We have a great selection of micro breweries and bottle shops that are sure to wet your whistle! Let us recommend some fun ways to explore our growing craft beer scene in Wilmington and Carolina Beach. The Wilmington Beer Festival coming up June 25th! Or for those of you who want to be active while drinking your brew, take part in the Brewery to Beach Bike Ride with Wilmington Brewing Company or a yoga class with Warrior Twos & Brews with Front Street Brewery. 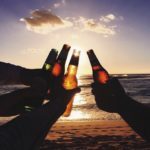 If you want to drink for a good cause, you may join Good Hops Brewing for their 5K Beer Run to support Friends of Pleasure Island State Parks. You can taste your way around town on a brewery tour like the Wilmington Trolley Pub or the Port City Brew Bus. We look forward to having you join us this summer to enjoy a cold one at the beach!